These are one of my favorite earrings right now. When I wear them I feel different. I feel like I can conquer anything! Amazonite has many different mystical and healing properties. It enhances creative expression, and improves self worth. 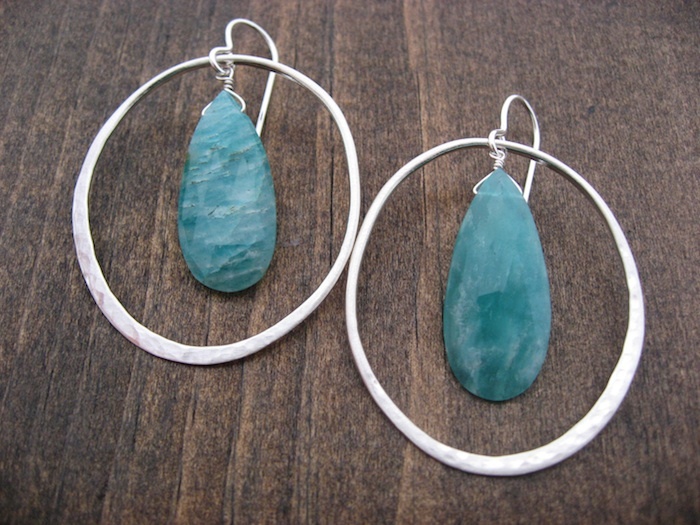 Amazonite is a soothing stone that offers confidence. It also brings forth the qualities of clarity, clear spirit, and balances the many aspects of ones personality. It is also said to reduce stress. It is said to stimulate ones artistic and creative side. Must be why I love wearing this stone so much! Every now and then I will be showcasing my favorite pieces and stones and giving you a little fun info on them. I have no proof that any of this is actually true but it’s interesting that I do feel different when I wear them. Maybe it has something to do with looking nice and getting a little dressed up once in awhile or there is some truth behind all of this.